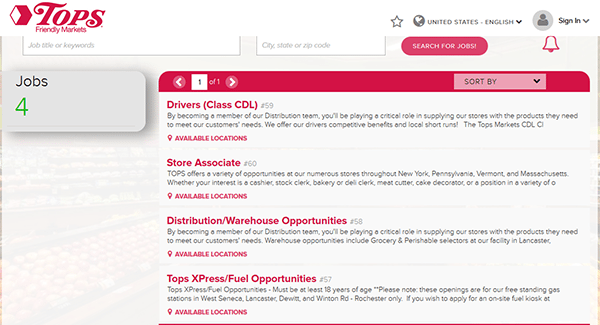 The Tops Friendly Market job application can be filled out and submitted by going to the company’s employment site. Use the links on this page to access the Top Friendly Market careers site. 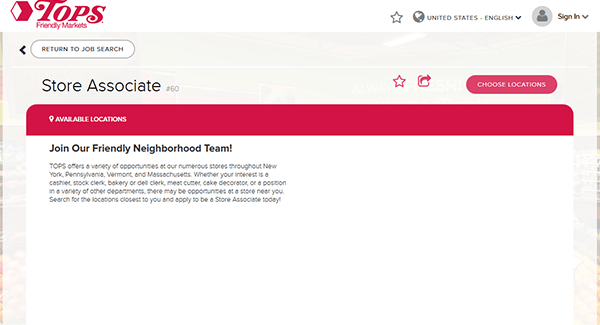 The guide posted below details how to search for current openings and submit an online application. Several different career types can be applied for including store, distribution/transportation, store management, and corporate positions. About the Company: Tops Friendly Markets is an American chain of grocery stores/supermarkets headquartered out of Williamsville, New York. The company operates locations throughout New York, Vermont, Pennsylvania, and Massachusetts. Step 1 – Click this link to have the company’s main employment page load in a new browser window tab/window. Step 2 – Press one of the “Apply Now” buttons to go to the main job search page (for the specific career area that you’re interested in). 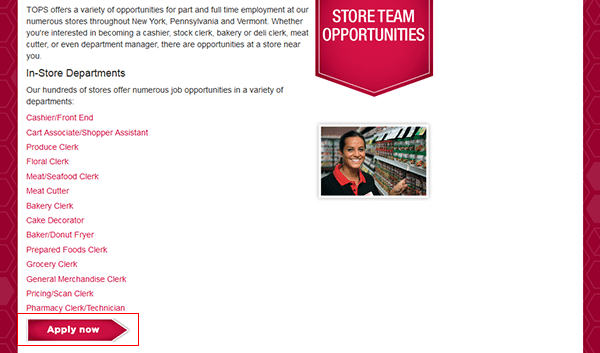 Note: These instructions detail how to search/apply for in-store positions. Step 3 – Click the link of the job title that you want to start the online hiring process for. Step 4 – Click the “Choose Locations” button and then select the specific locations that you want to apply to. Step 5 – Fill in your email address and then create/verify your password. Press the “Create Account” button to register your account. Step 8 – After the application has been completed you will be able to submit the form for review/processing. Note: You will be contacted via email or phone in response to your application.